These days, I often find myself thinking more about holsters than guns. Comfort, accessibility, mode of dress, and anticipated activities are all factors in a complex equation. smooth, fast draw. A fine holster will be thin yet strong. It will shield the trigger but not grab it. The choices in holsters can be bewildering, but if you let your common sense, your mode of dress, and logic guide you, the problem simplifies. The best draw is from a belt holster on the strong side. The strong side belt holster provides for a faster draw, better retention, and fewer problems than other styles of holsters. In my own opinion, the strong side belt holster is the fastest and most comfortable holster. Their weakness is that they provide very little concealment and you must either wear a shirt with a very long shirt tail out (a look I don’t really like) or you need a long coat. If you normally wear a traditional blazer, the belt holster is no problem. Also, belt holsters of all types tend to pull down on the belt, necessitating a fairly tight cinch-up to keep the weight from dragging the belt and pants down. If you prefer your shirt tucked in and intend to only wear a short jacket or sweatshirt, the “Inside the Waistband” (IWB) holster is an excellent solution. These holsters ride inside your pants with only straps or a clip being outside the waistband of your pants. 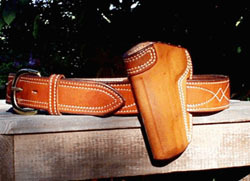 Generally this holster is worn just behind the crest of the hip on the strong side. This style provides excellent concealment and holds the gun to you very securely. 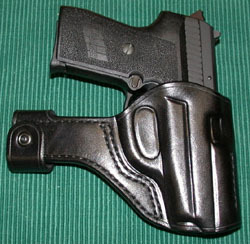 A short windbreaker or jacket will completely cover this type of holster. The tension of your belt pulls the gun in toward your body, enhancing concealment and rendering retention snaps unnecessary. This style is my second favorite and I use them a lot. The downside of these holsters is that they are not quite as comfortable as the belt holster and tend to be a bit harder on the finish of the gun. The IWB holster also requires that you use a belt that is approximately 2″ longer than you would normally wear. seated in a car with a seat belt on. Shoulder holsters usually provide carriers for two spare magazines – two rather than one because the two counterbalance the weight of the gun better. This is more spare ammo than most civilian CCW carriers carry, and it could be an advantage in a bad situation. 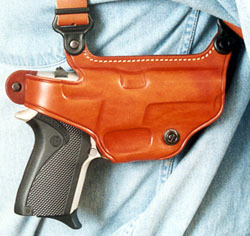 Pocket guns and pocket holsters are an important option for concealed carry. I will leave the question of combat effectiveness of pocket guns for another article, but the fact is that many people choose to carry small, compact pistols because of their size and relatively light weight. I do think that it’s important to carry a pocket gun in a holster for two reasons. 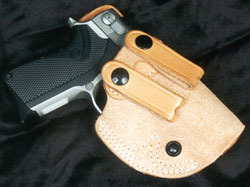 First, the holster breaks the lines of the gun and enhances conceal-ability. Second, a good pocket holster will cover the trigger of the gun and protect you against the possibility of getting foreign objects into the trigger guard which can cause the gun to go off. 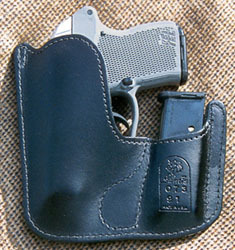 The trick with the pocket holster is to find a design which will stay in the pocket when the gun is drawn. 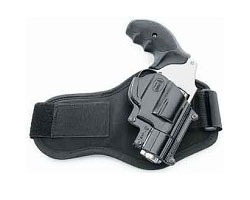 This may require a coordination of the holster design with the pockets of the particular clothing you intend to use. While you probably won’t do a whole lot of practice with a pocket holster, it is important to test the draw to make sure that the gun comes out of the holster smoothly without hanging up. Some styles I’m not too fond include “small of the back” and ankle holsters. The “small of the back” holster has some problems. The draw is dicey and kind of difficult. There is a danger of sweeping the muzzle of the gun in directions you don’t intend to cover. This is an easy holster to disarm. Someone can come up behind you and grab the pistol, and due to its position on your back, it is very difficult to stop them from taking it. Lastly, should you fall on your back, the small of the back holster is a steel bar across your spine that could accentuate the impact of hitting the ground and perhaps hurt you worse. The leg holster is only really valid as a backup option and it’s not really great as a backup. The ankle holster is great concealment, but the draw is so problematic that it is almost useless. When you select your gun, you will need a holster that works with it so it is important to know if the right holster is available for the gun you intend to carry. The gun and the holster are two parts of a single system which must work perfectly together. The equation is complex. The gun must be combat effective but not so huge as to be uncomfortable and impossible to conceal. 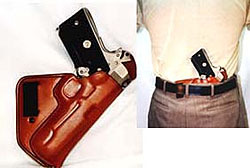 The holster must fit the gun well, provide adequate concealment and yet ready accessibility in an emergency. Females face special difficulties with concealment holsters. 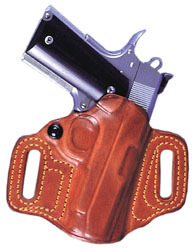 The vast majority of holsters are designed for men. The problem is that men and women are built differently. The female torso tends to be an “hour glass” shape and shorter from hip to shoulder. The complaints most frequently heard from women are that their holster “rides way too high, and the grip of the gun is up around my armpit.” A holster designed around the male body will ride uncomfortably high on a woman. A woman’s curving hips tend to push the muzzle of the gun outward, causing the grip of the gun to jam into her ribs. A number of quality holster makers including Del Fatti, Kramer, Chris Cunningham, Blade Tech, Sunrise Leather, and many others build holsters specifically designed for women. 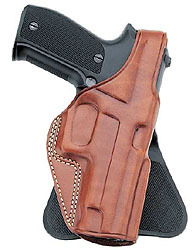 For an excellent article on fitting a holster to the female shape, click here. The important learning here is that women have special needs in a holster and there are products out there which address these needs. Don’t let a clerk at the local gun store stick you with a holster that doesn’t work and digs into your ribs. The best belt holster in the world won’t do you any good if your skirt doesn’t accommodate a belt. For folks who don’t wear belts or don’t wear belts which are wide enough and firm enough to support a holster and reload, paddle style holsters are a viable option. These holsters are much like belt holsters except that, instead of loops or slits for a belt, they have a “paddle” affixed to the back of them which slips inside your pants or skirt and holds the gun to your side. If you do select a belt holster, plan on wearing a belt which is thick enough and wide enough to hold the holster firmly to your side. This usually means a belt of 1 1/8″ – 1 1/2″ in width, and thick enough to be strong. If your style of dress dictates half inch belts, the belt holster will move around too much. This returns us to the issue of gun selection and lifestyle. The mode of dress must be able to accommodate the firearm. You can’t carry a Colt Anaconda in your pocket. If you really must dress in a particular style, the gun must be able to adapt that type of clothing. This is a terrible trade-off, but it’s better to have the Kel-Tec P32 in your pocket than to not have the Government Model .45 which you had to leave at home. While there is certainly a role to play for these modes of carry, they all suffer from serious tactical problems. Most of these difficulties have to do with the difficulty of the draw and the issue of control of the weapon. Packs, planners, satchels and purses are a control nightmare. Carrying them all the time may look extremely unnatural and leaving them laying around unattended is very risky and dangerous. Access to the gun may be slow and awkward. Muggers will often grab a woman’s purse first, and if he succeeds, he not only gets your wallet but he is suddenly armed with your gun. For many, the fanny pack screams, “GUN,” but this often depends on the area where you are. In my area, lots of people use fanny packs that don’t carry guns, but usually when I see a male with a fanny pack, I look to see if he has a wallet in his hip pocket. Odds are good that if the wallet is in the pocket, a gun in in the pack. Also, getting the gun out of the pack and into action can be pretty slow. An additional advantage to strong-side belt holsters and IWB styles is that these holsters are the styles that are generally “legal” for IDPA and similar types of pistol matches. (Fanny packs, shoulder holster, small of the back, and cross-draw holsters are not allowed for any kind of match shooting I know of.) Participation in these kinds of matches provides valuable practice in drawing and firing the gun. To return to a familiar refrain: practice, practice, practice. Drawing a .45 automatic from concealment, acquiring the target and placing two shots in the “A zone” is not a skill most of us are born with. It must be learned and practiced in order to perform it safely and effectively. The holster is a critical component of the system. Pistol Packin’ and Concealed Carry and the “Large” Auto Pistol By Jim Higginbotham.